If you like to spend time outside in the sun or at the beach with your dog, you’ll want to consider buying him the best dog goggles that the market has to offer. But why should you get your canine companion dog goggles? In this article, we look at why dogs should wear goggles and other dog paraphernalia. Everyone knows that the UV rays in sunlight can burn your skin, potentially causing serious health problems such as skin cancer. But did you know that UV rays can also damage your eyes? The best dog goggles will protect him from these risks. At the beach, your dog could kick up sand when he’s running with his friends, potentially causing him severe eye irritation. Brachycephalic (short-nosed) breeds are especially susceptible to eye injuries and inherited eye problems. 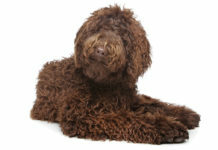 These breeds have flat faces and large, bulging eyes. Also, these dogs are small and stand close to the ground, making them more likely to sustain injury from branches as they run through undergrowth. Some pups have specific jobs that may see them benefit from wearing eye protection. 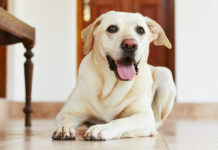 For example, search-and-rescue dogs such as bloodhounds and Labradors or police dogs such as German shepherds are all at risk of sustaining injury from undergrowth or flying debris as they go about their duties. Also, criminals bent on escaping the law are not averse to spraying chemical irritants at pursuing K9 dogs and even home guard dogs. 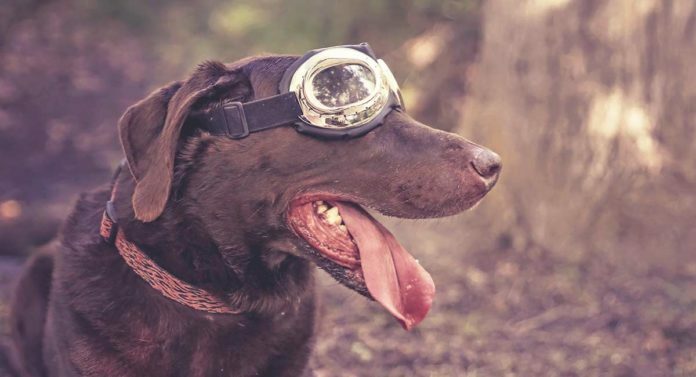 So, now that we’ve looked at why you might want to buy some dog goggles for your pup, let’s have a closer look at the very best products out there in the marketplace. QUMY Dog Sunglasses are the ultimate practical, fashionable dog goggles. That’s why they’re one of the best-sellers on Amazon. The goggles come in a range of colors, including white, black, pink, red and blue. They’re designed for dogs over about 15 lbs and have elasticated, fully adjustable head and chin bands for a secure and comfy fit. The frame is lined with foam cushion to prevent rubbing and ensure comfort for your dog. The goggles can be folded up for ease of carrying, and a neat carrying case is included. The goggles have inbuilt UV protection and a shatterproof lens for protection against windblown debris, water and bright sunlight. An anti-fog version of the lens is available. The design boasts a wider nose-bridge, sturdier frame and deeper lens cup than other comparable brands. NACOCO Pet Glasses Dog Sunglasses are designed for use by dogs weighing over 13 lbs. The goggles come in a variety of funky colors, including black, yellow, white, blue, red and pink. These quality-assured dog goggles have adjustable head and chin straps so you can be sure that the goggles will be comfortable for your pet, without the risk of them falling off during vigorous play. Petleso Large Dog Goggles Sunglasses are another brand of dog goggles that are top sellers on Amazon. The goggles come with frames in red, silver, or white. The goggles have easily adjustable straps that fit over your dog’s head and under his chin. 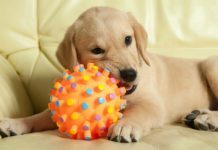 The design is made to fit dogs up to average size of a golden retriever. The lenses are shatterproof polycarbonate, giving great protection against wind, bright sunlight, dust and tree branches. Enjoying Dog Goggles are small dog goggles that are designed with the more petite pup in mind, and they’re also one of Amazon’s best-selling dog sunglasses brands. The waterproof goggles have a fully adjustable head and chin band, and feature high-quality lenses that give protection for your pup against UV rays, flying debris and water. The frame is cushion-padded with foam for extra comfort. The goggles come with black or pink frames. Doggles – ILS Shiny Red Frame with Smoke Lens are specifically designed to fit the smaller dog. These small and extra-small dog goggles feature an extra-wide nose bridge; padded and flexible rubber frame; and soft, elastic chin and head straps. The lenses are shatterproof and anti-fog, providing 100 percent UV protection for your pet on sunny days, as well as deflecting potentially harmful dust, debris and salt water spray. Doggles Originalz Frame Goggles for Dogs are an extremely popular dog goggle brand, worn by working dogs around the world, including K9 units, search and rescue dogs, and border patrol dogs. This make is also popular as guard dog goggles. The super-flexible, chrome-colored frames house 100 percent UV protection, anti-fog, shatterproof, smoke-tinted lenses. 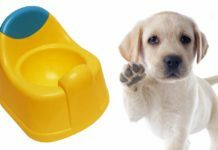 The lens cups are deep to ensure that the lens does not come into contact with your dog’s eye, preventing potentially harmful rubbing and abrasion injuries. The design is available in a variety of sizes, including extra small dog goggles. All the dog goggles we’ve looked at so far have tinted or very dark lenses. That’s great if you want to give your pup protection against bright sunlight or from the dazzle caused by the reflection of light from snow or water. But what about dull days or even at night? Just because the sun isn’t shining doesn’t mean that your dog won’t need eye protection. 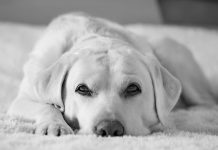 Guard dogs, working dogs and hunting dogs often work during the hours of darkness in conditions that could present a risk to their eyes. So, what’s the solution? Clear dog goggles can provide great eye protection for your pup. Rex Specs Dog Goggles are an extremely high-quality product that come in at a slightly higher price point than the other brands that we’ve reviewed so far. However, these dog goggles are the preferred canine eye protection for many professional dog handlers in military and law enforcement organizations around the world. The dog goggles come with two lenses: one clear lens and another tinted lens of your choice. These human-grade lenses are interchangeable, spherical and UV400 rated, providing your dog with 99.9 precent protection from UVA/UVB rays. Also, the lenses are rated ANSI Z87.1 for impact resistance, making them super-strong and shatterproof. A dynamic strap system allows for a secure, comfortable fit while permitting your dog full movement of his jaw. The single lens design allows the wearer full range of vision. 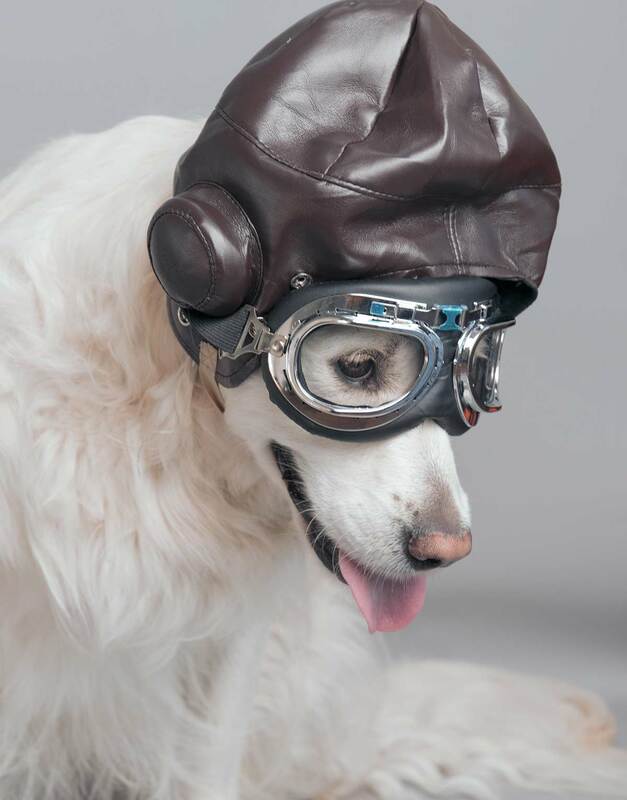 The large size goggles are designed to fit dogs from 30 to 100 lbs, depending on their head shape. The small size goggles are the best fit for flat-faced dogs. Frame colors include black, chrome, and orange. If you’re concerned that your pup might not take to wearing his new goggles, the company provides a helpful video with tips regarding how to teach your dog to wear eye protection. Check out the product link above to watch the video and read the full spec of these top-quality dog goggles. If you want your pooch to look trendy on the beach, you might want to buy him a pair of fashion sunglasses. Remember that these specs are purely designed to be a fashion accessory for the dog about town, not as eye protection. Fashion Cool Cat Glasses look très cool. The round-framed, retro-style sunglasses have acrylic lenses and a metal frame with elasticated straps to help keep the shades in place. Dog goggles are so much more than just a way of making your pet look cool on the beach or at the park. 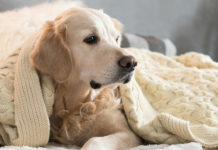 If you and your pet enjoy spending time outdoors together, especially during the summer months, there’s a risk that your dog could sustain eye damage. Bright UV rays, windblown dust and debris, and even salt water spay can all be irritating and potentially harmful to your pet’s eyes. A good-quality pair of dog goggles such as those we’ve featured in this article could help keep your pet safe and comfortable. Does your dog wear dog goggles or dog sunglasses? Did you choose a brand that we featured in this guide? Share your story with us in the comments section below. We’d really love to know. van Kuijk, F.J., 1991, “Effects of ultraviolet light on the eye: role of protective glasses,” Environmental Health Perspectives.